Growing up, Halloween meant two things to me... okay, one thing... candy! Dressing up was the other thing, but I realize now that was just a means to an end. I was fortunate enough to grow up in the suburbs, where three or four solid hours of trick-or-treating would yield you a pillowcase full of candy. Like many kids, I dressed up as movie characters, monsters, and robots in an effort to feed my sweet tooth. Halloween has always been one of my favorite holidays, from the decorations, to carving jack-o-lanterns, to the scary stories. During my research I have found that the holiday's history is a lot more scary than the made-up faces and haunted hayrides of these modern times. 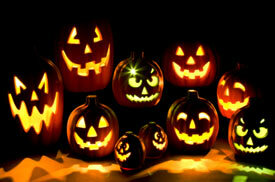 Halloween's beginnings take place around 500 B.C. in the area that is now Great Britain, France, Scotland, and Ireland. October 31st commemorated "Samhain," or the Celtic New Year -- the day marked the end of the summer season, the end of the harvest, and the beginning of winter. The Druids, who were the spiritual and intellectual leaders of the Celts, believed that on this day the barrier between the physical world and the spirit realm is suspended -- it's the day the spirits, elves, and fairies are allowed to not only walk among the living, but also meddle in our affairs. To appease the ghosts and monsters of the past, the Celts built large bonfires, had sacrifices of animals and food offerings, and held celebrations. The celebrations included such practices as bobbing for apples -- the first to come up with an apple in their mouth would be the first to marry in the coming year. The events were also designed to welcome and honor the Moon Goddess, who is now more prominent due to the shorter days. For hundreds of years, these Pagan rituals took place until they were eventually suppressed, as the Roman Empire and then Christianity spread throughout the region. Though the rituals were suppressed, they never completely went away. In 601 A.D. Pope Gregory started a trend in Catholicism that continued for centuries. Rather than trying to wipe out ancient customs and celebrations, he instructed his missionaries to bless them and put the Christian spin on it. For example, if a tribe worshiped a boulder, consecrate the boulder in the name of Christ and it's now okay to "appreciate" the boulder. This is how Halloween would eventually get its name. In 835 A.D. Pope Gregory IV moved "All Saints Day" to November 1 in an effort to put a religious spin on a Pagan holiday that was not going away. This made October 31st All Hallow's Eve, Holy Evening, or the night before All Saints Day. Eventually, "All Hallow's Eve" was shortened to Hallow'een. So what about the candy? The practice of going door-to-door "begging" was around for many years. The poor would dress up and perform mini plays or a song in hopes of getting food, drinks, or money from each home. This practice went on throughout the year, not just Halloween. To discuss some of the rest of our Halloween traditions, we need to fast-forward almost 1,000 years to the 1800s. Some Irish folklore describes the story of a drunkard vagrant named Jack who tricked the devil up a tree and then carved a crucifix into the bark, trapping the demon. Jack made a deal with the devil that he would let him out of the tree if he promised not to tempt or torment Jack anymore. The devil agreed and they parted ways for the moment, but they were destined to meet one more time. When Jack died, he wasn't allowed into heaven because of his bad lifestyle, and he wasn't allowed into hell because of his deal with the devil. So the devil gave Jack a glowing ember to light his way through eternal darkness. Jack placed that ember into a carved turnip so he could carry it. The Irish were known to create lanterns from turnips, potatoes, and beets throughout the year (not just at Halloween). Thus, a vegetable with a candle in it became known as a jack-o-lantern. During the Irish potato famine of 1845-1850, many people immigrated to the United States, and they brought some of their folklore and rituals with them. In America, pumpkins were plentiful and replaced the turnip as the jack-o-lantern of choice. One of the other practices the Irish and Scots brought over was "mischief night" on Halloween (the trick part of All Hallow's Eve) -- a night where people would sneak around playing pranks such as unhinging gates, tipping over outhouses, and other general mischief. The next day, to avoid repercussions, the pranksters claimed it was the work of ghosts, goblins, and witches. Halloween's "treat" would come many years later. Mischief night grew not only in popularity, but in severity as well. In the late 1920s, the destruction was getting to be a problem. Add mischief night to the frustration of the oncoming "Great Depression," and disaster was brewing. My grandmother, Bunny Chamberland, was born in 1919 and grew up in Southbridge, Massachusetts. She remembers some of the pranks that were played in the 1920s: "In those days there were a lot of horses, and they used to throw the manure around. Other hellions would let the cows out of the field and they would wander into the road, kids would throw eggs at houses -- it really did get out of hand at times." In the late 1920s and early 1930s, local civic organizations were mobilizing to provide a safe Halloween. Children were being encouraged to go door-to-door to get a treat from each house or place of business. "All of the houses participated in giving out treats on Halloween because they were afraid there would be some mischievous repercussions if they didn't," Mrs. Chamberland said. "We didn't dress up in any costumes during those first few Halloweens, but we wore our old clothes. I remember the kids would get together in the street and tell each other which houses were giving out chocolate bars. It didn't take too many years until we all took 'beggar's night' for granted." It was this early form of "hellion extortion" that served to keep troublemakers at bay, and it also launched a phrase that has been popular ever since..."Trick or treat!" Halloween is by far most popular in the United States, but it is also practiced in Canada, Great Britain, Ireland, Australia, and the Philippines. Today, many Pagans and Witches still hold Halloween in high regard (as well they should -- it started as a Pagan holiday thousands of years ago), and other cults and Satanists have also adopted the day with a more evil tone, practicing sacrifices and worship -- though there never really was anything "evil" in the folklore to warrant this. No matter if your personal beliefs are sacred, secular, Halloween holds mystery, suspense, fear, ghosts, goblins, and thankfully... candy for just about all of us. Summer has ended, the harvest has been brought in, and winter is surely coming. Candlelight will dance in carved jack-o-lanterns, and more than 2,500 years of history remind us that for this one day, the dead, witches, goblins, and fairies will walk among us.